In the plane to Tokyo I thought a lot about our motivation as budo practitioners. I have been travelling to Japan many times and I did some math and figured out that I spent over 1000 hours to fly there! So why are we doing that? We know that the knowledge acquired during those numerous hours of training will never be used in a real life and death situation; but still we keep spending money and time for it. Why? Honestly I do not have the correct answer or conversely I have many. So even if I see it as some kind of addiction, I trust that this is the best way to develop ourselves and become better humans. Addictions are bad except if they reveal something extraordinary and this is the case for the Bujinkan arts. This is why I am worried to see that modern practitioners do not seem to have the same commitment I have put in my training. There is nothing wrong about it but then why do they train if they don’t commit fully? With the spread of those virtual tools such as facebook, tweeter, etc we get more virtual and less real. Maybe is it a trend of our society but if people are more into virtual action why do they come to the dôjô. I have been wondering a lot recently about it. In some dôjô, training is not the main thing, the real thing is the social gathering. Social gathering is always fun and I enjoy it once in a while but never during classes as in the dôjô, training should be the only motivation together with learning an old philosophy of life. 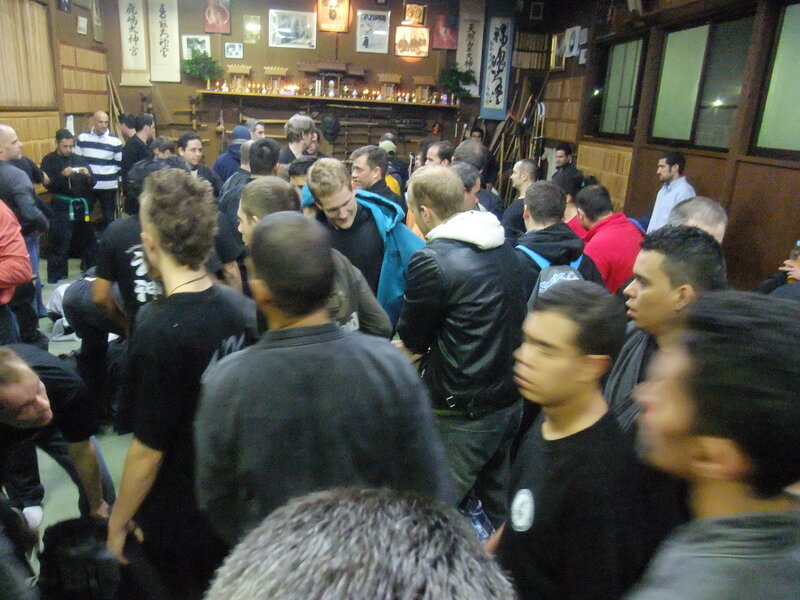 The Bujinkan is not a “shakaiteki no budô” 社会的の武道 i.e. a “social budô”, it is a “seimei no budô” 生命の武道 i.e. a “budô of Life”. In Japanese “shakaiteki” means “social”. It is a mix of “shaka” (public) and “iteki” (barbarians). For the Japanese a “barbarian” is an uncivilized person (cf. gaijin). Therefore and playing with the japanese sounds, I invite you to transform this “shakaiteki” 社会的 into “sha ka iteki” 汝貝夷狄 where sha is “you”; kai is “shell, protection”; and iteki is “barbarian”. Discard the social budô and train a Sha Kai Teki no Budô, a “budô protecting you from losing your civilized education”. A “seimei no budô” like the Bujinkan is something that gives more values and more meaning, not less. And this require a true commitment and a lot of efforts (sei is “the nature of a person”; Mei is “clarity”). Recently in a class, speaking about the theme for 2012, Hatsumi sensei said we were learning “jinryû no kaname wo mamoru” which can be understood as “protection is the essential point of human spirit”. So protect yourself and others (kai) and become the man you really are. Through the practice of Bujinkan martial arts unveil your “sei mei” 性明 your “true clear nature” and become able to walk proudly as a human being controlling his destiny (sei, 制 – control; mei, 命 – destiny). Don’t miss this chance, and train when you are on the mats because if not, everything you have done so far would have been in vain.